It has been over two weeks since the end of chemo treatments. There are still days when the side effects of the chemo keep me from doing too much, but I am gaining more strength and energy as each day goes by. On Friday, I finally had surgery to get my arm port removed. That thing has been "trouble" ever since the day it was put in nearly 8 weeks ago - swelling, discomfort, and it was only able to be accessed twice. So, I was so glad to have it removed. I knew that removing my port was a simple surgery, however, there are always risks involved. So, it was perfect timing when I read a specific verse the morning before the surgery. 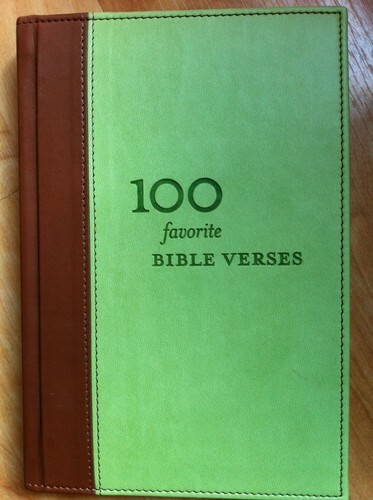 Awhile back, a friend of mine gave me a Hallmark gift book called, "100 Favorite Bible Verses." I read #37 out of this book, which was Proverbs 3:5 - "Trust in the Lord with all your heart, and lean not on your own understanding." It was just what I needed to help me be at peace - something to remind me that, no matter what happens, my God is trustworthy. The surgery went well, although, in pre-op they had trouble getting an IV inserted. The swelling in my left arm kept them from trying a vein on that side, and I am not supposed to have an IV in my right arm due to the mastectomy and the risk of increasing lymphedema. So, they tried to use a vein in my left foot. The vein blew. They tried a vein in my right foot. It did not blow, but they could not get it inserted correctly. With no other options (or, so I thought), I suggested they go ahead and use the vein in my right arm without using a tourniquet. The nurse went ahead and did that without consulting the Anesthesiologist and, when he found out, he told them to take it out. Then, they brought in some sort of ultrasound machine to help the doctor find and access a vein in my right ankle. That one finally worked - barely! Not sure what the next option would have been if that one had not worked. After surgery, I was sore, of course and needed pain medication. Today (two days later) I am free of pain meds, however, the swelling in my arm and hand has increased to where I can barely see my knuckles. With time, it should improve as the arm heals. That is my prayer, anyway. Please join me in praying for quick healing of my arm, as well as for the rest of my body as it recovers from chemo. It has been a big journey. He holds your right hand. Vicky, Keep hanging in there. It will get better and you will feel better soon. Oh Vicky my sweet friend...so sorry that Friday was hard. I know the Lord brought You through all of this. I hate seeing your hand like this.